A real rocket scientist who'd rather write fantasy/sci-fi than taking a journey into outspace and face all the real perils that await. After writing journal articles for many years and moving into management, I wanted to relive my childhood and found that writing brought back the fountain of youth. I write for the warmth it gives my heart and live for the joy it brings others. Imprisoned, observed, goaded. This was the life the demigod had endured for over a decade. The people who held him sent a new observer; the others had met their end, more often by his hand, or more precisely, his thumb. This one he named Bookworm, and to him the demigod finally begins to divulge his secrets. He whispers of how a demigod is created, of sacrifice and of worship. This demigod had failed his people, failed to uphold the values they had expected of him, and he brought about the end. It had started so innocently, a desire to better the country, create a sustainable life, but allies became enemies, robbing him of his family, his motivations. But this had been his beginning, the time his power awoke. They need to understand him, to understand their kind. This demigod was the cause of the apocalypse, and now it seems he is the sole hope of the survivors. 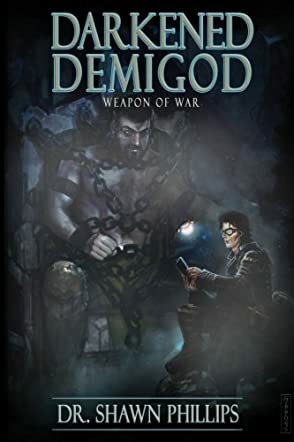 There is a hint of American Gods within the pages of Dr Shawn Phillips’ Darkened Demigod: Weapon of War, specifically how worship creates power, although the mechanics take on a slightly different twist, making their own miracle interventions via a petition for prayer. The characters are well developed and their little mysteries and histories are slowly revealed as the characters gain depth and grow throughout the complex plot. Despite a steady paced start, you'll soon see a rise of momentum to create a super powered, dystopian science fiction tale. There are some fascinating ideas, and many of the scientific aspects are well explained, especially for those who know their stuff; clearly a lot of time, thought, and research was spent perfecting this aspect. This book has a bit of everything, from comedy to involved science and philosophy, not forgetting the occasional twist or surprise to keep the reader on their toes. If you enjoy a science fiction space drama, then this will certainly appeal, and as a bonus it also gives the reader a little something to think about themselves.